My husband is extraordinarily handsome in a suit. He is one of the best conversationalists I have ever met and he is also completely hilarious. He always takes the garbage and recycling out and does more than his fair share of laundry without being asked. I would not trade him for the world, but my attractive business minded man is not handy. Our air conditioner is out and it is 91 degrees in the house. Yesterday my son and his friend accidentally ripped a down spout off our house with the garden hose. We tried to get someone in here to fix the air, but the words, "$189 per hour excluding parts if you want someone there before next Thursday," didn't sit too well. Not to be outdone, Leif and I dragged out an 80 year old rickety ladder that came with our 1921 bungalow and tried to repair the twisted down spout last night. While perched atop a swaying ladder I only ended up spewing attractive phrases like, "Leif don't be stupid. You are just being stupid." Anyone who knows Leif and me will find that to be uncharacteristic to say the least. My downspout is still a mangled mess and my neighbor's niece's daughter's husband (Bueller? Bueller?) is coming to look at our angry air conditioner tonight. And I am left sitting here, sweating buckets, praying it doesn't rain, fantasizing about handy men. This is not a new fantasy...I always get a thrill when I find flyers from local handymen on my front door. 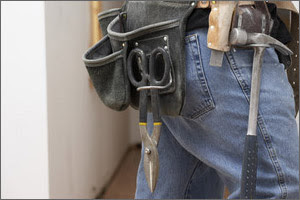 Some people may find a doctor's ability to stitch a wound or a runner's ability to complete a marathon in just over two hours attractive, but for me it is the man with a tool belt who does the trick. His powerful ability to lay a brick patio, build a fence, hang a new lamp, mount shelves in a shed, refinish a floor...and all at cost if I just knew him well enough...just makes me a little bit googly eyed.